This weekend’s Hamilton “Fast Four” Sevens was - in effect - simply an invitational warm-up event, and a dry-run for a possible future World Series event, but it attracted a profile and significance far beyond that for one important reason. Over 20 years after they first took the field the Black Ferns were making their home debut. China and England selected relatively young teams - each included three teenagers – but England also included several players with significant World Series experience, whereas China fielded only three players who had played outside Asia before. France and New Zealand were slightly less experimental, but also had a number of faces new to international sevens alongside a core of more experienced names. The tournament was played during a round of the men’s seven series, filling the “buffer” periods that are usually timetabled between each round. France opened against China, and ran out easy but far from overwhelming winners. Europe’s leading World Series team ran in three first half tries to lead 19-0 at the break, but a reorganised Chinese team proved much more difficult to break down in the second period, and pulled a try back with three minutes to go, before two late French scores gave them a 31-7 win. 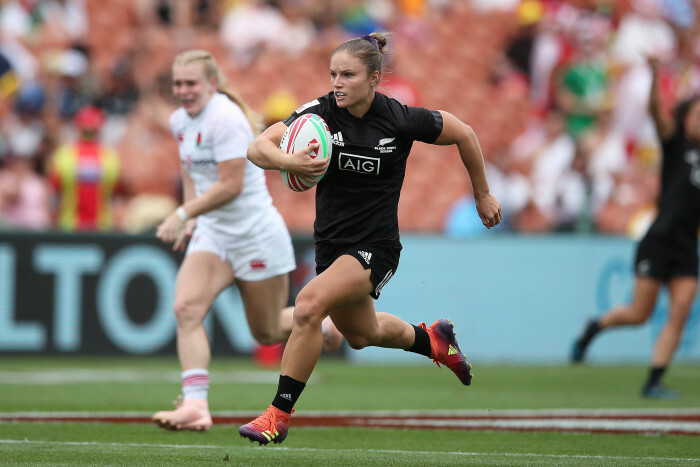 New Zealand made their much awaited debut next against England, and Michaela Blyde opened the scoring in the first minute, spotting a gap in the English line to explode away and score under the posts. Sarah Hirini (nee Goss) doubled the lead shortly afterwards, but England fought back through Helena Rowland setting up a tense second half that saw the teams exchange one try each, the Ferns winning narrowly 19-14. The second round saw England eventually beat China 33-14, but only after a small shock that had seen China pull back from two early English scores to tie the game at 14-14 at halftime. The final game saw New Zealand – their nerves settled perhaps after the win over England – put on more of a display against France , with three first half tries putting them in command, leading 17-0 at halftime. France pulled a try back early in the second half, but the Ferns remained on top, Blyde ending the day as she had started it, the 24-5 win putting New Zealand into Sunday’s final. Sunday saw the Ferns firmly into their stride as they dismissed the Chinese 41-0 in their final pool game, setting up the question as to who would meet them in the final – a straight fight between England and France. England took an early lead, with an even first half ending 5-5. Despite France taking an early lead in the second half the match remained very even until the French switched on virtually their entire bench, a risky move that paid off for the French who quickly added two more tries to eventually run out 24-12 winners. The playoff games were both one sided affairs, England taking third with a 26-7 win over China, running away with the game in the second half, before a now unstoppable Ferns side beat the French five tries to nil (31-0), with French mass second-half substitutions this time having no effect.